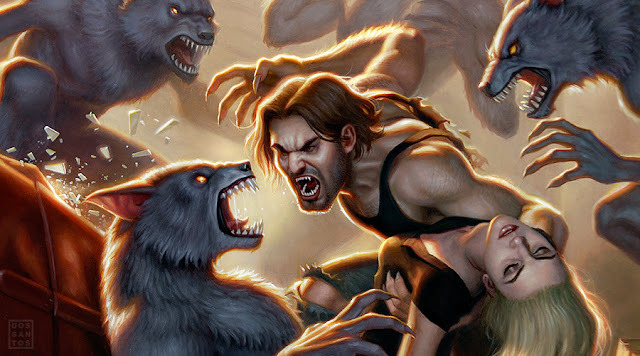 In 2009, I was asked to paint the cover for Bill Willingham's 'Fables: Werewolves of the Heartland'. I am a big fan of 'Fables', and as such was really honored to do the cover for one of my favorite authors. The book, unfortunately, was absolutely plagued with delays. It would be slated for release, only to be delayed over and over again. It even went so far as to appear on the cover of 'Previews', only to be delayed yet again for another whole year! This was not through any fault of the AD or the Author or Artists, mind you... it really was just bad timing. The artists who did the interior work had other time sensitive projects to work on. 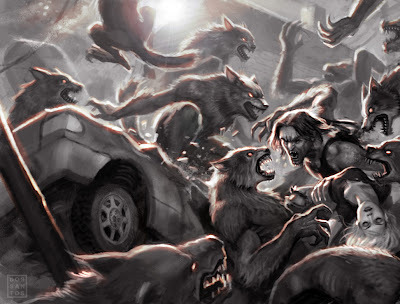 Additionally, the Editors felt that certain things needed to be further established in the 'Fables' timeline before this standalone book should be released. The result, a 3 year gap from creation to publication of this cover! Well, I am happy to say that as of last Wednesday, the book is finally on the shelves. 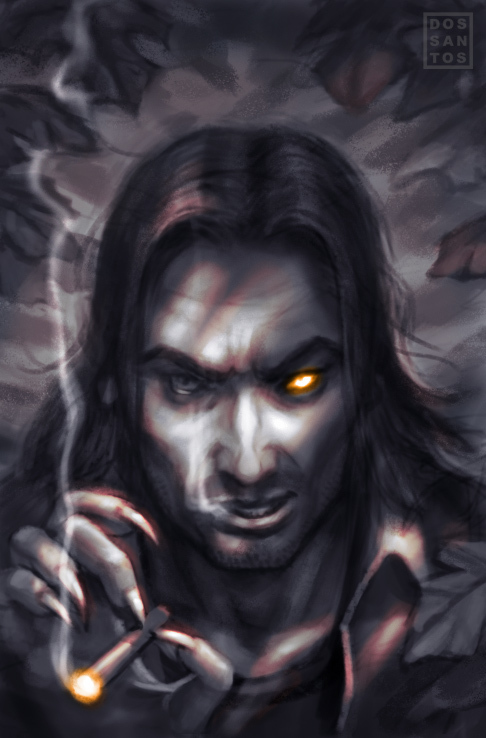 Which means I can publicly share the cover and it's process in entirety. 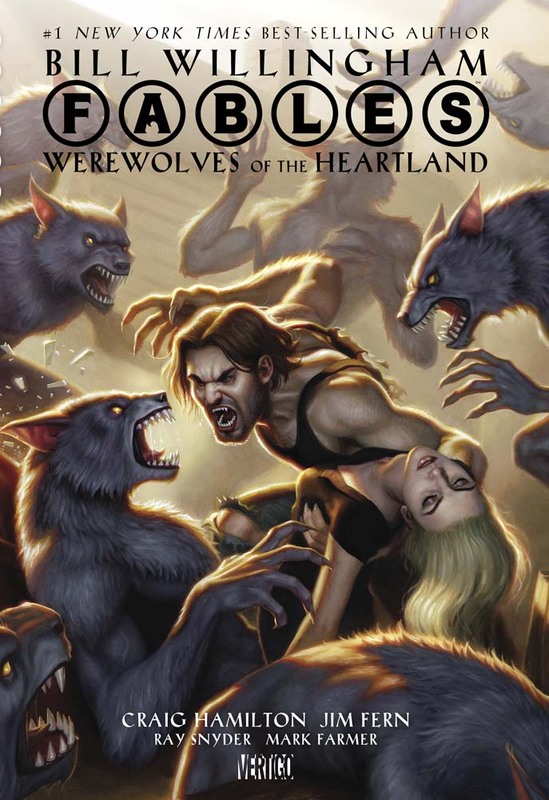 The basic premise of the book is that Bigby Wolf (A shapeshifting werewolf who happens to be THE big, bad wolf of legend) stumbles across a midwestern town where apparently ALL of the residents are werwolves. 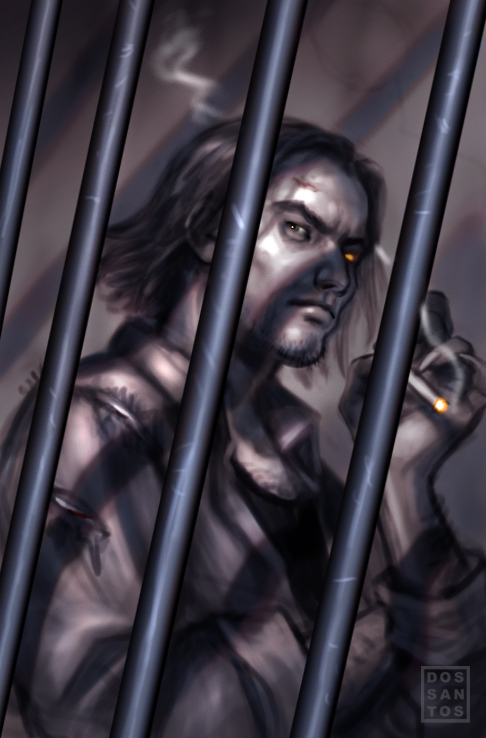 The residents take Bigby hostage, not realizing that he could easily escape anytime he wants. 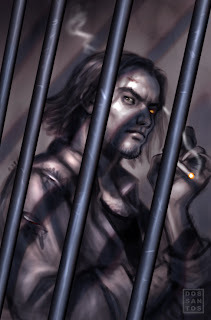 He chooses to stay imprisoned in order to further explore the mysteries of the town, and figure out how it is that there are werewolves he didn't know about. 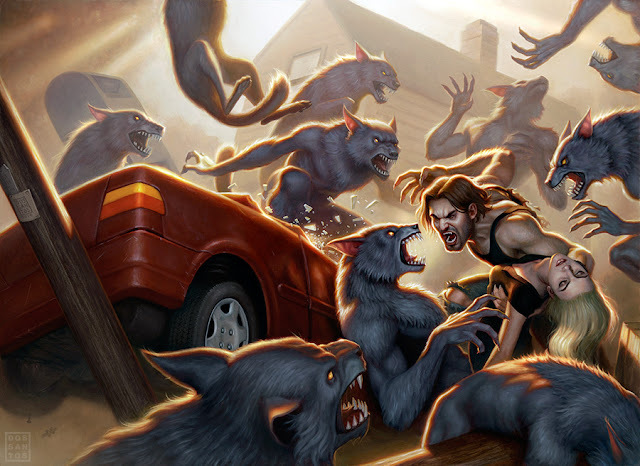 She hadn't specifically asked for a wraparound cover (which most artists usually charge extra for). But as I mentioned, I am a big fan of the series, and so I really wanted to do a large piece that I would be personally proud of. 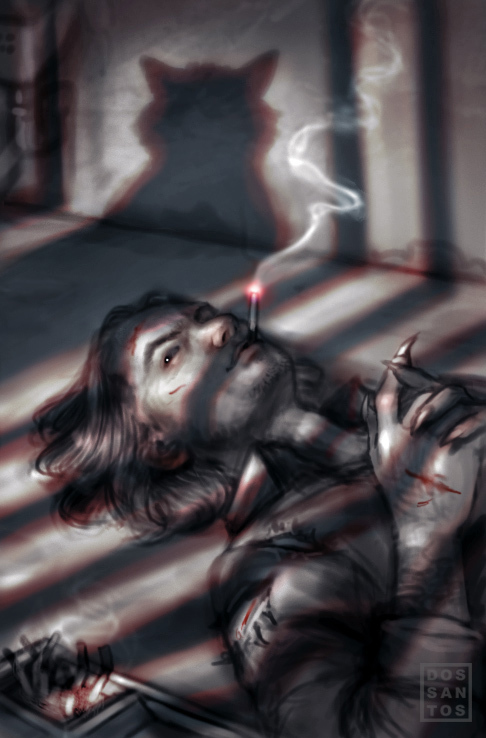 I think we all felt the first sketch best captured the 'essence' of Bigby, and was really close to being the chosen cover. 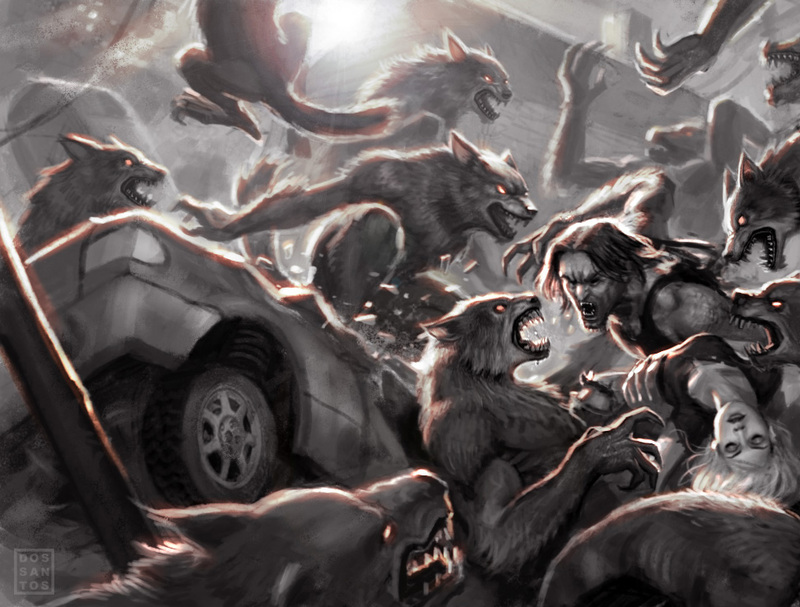 But ultimately the AD and the Author both saw that was I personally invested in the wraparound cover, and let me go ahead with the image.